Apple confident that new smaller version of its beloved tablet will trump lower-priced offerings by rivals Amazon, Google and Samsung. Apple introduced its iPad mini on Tuesday, confident that a smaller version of its beloved tablet computer will trump lower-priced offerings by rivals Amazon, Google and Samsung, AFP reported. As Apple's senior vice president for marketing, Phil Schiller, held up the new gadget at a company event in San Jose, he said that it “isn't just a shrunken down iPad. It is an entirely new design." Apple’s Chief executive Tim Cook coolly presided over the launch of what was considered his first Apple product not bearing the thumbprint of late co-founder Steve Jobs. 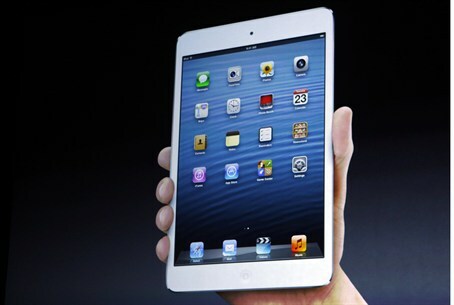 The iPad mini's touchscreen measures 7.9 inches diagonally compared to 9.7 inches on the original iPad, noted AFP. A 16-gigabyte version of the iPad mini with Wi-Fi connectivity costs $329, while a 16GB model with both Wi-Fi and cellular capability costs $459. The top-of-the-line 64GB iPad mini with Wi-Fi and cellular connectivity will sell for $659. Like later versions of the original iPad, the new Apple tablet also features rear- and front-facing cameras. Schiller said customers could begin pre-ordering the iPad mini on October 26 and that Wi-Fi versions would begin shipping on November 2 to about three dozen countries in Asia and Europe, in addition to the United States. He said the iPad mini weighs 0.68 pounds, less than half the original, and is 7.2mm thick -- thinner than a pencil. "We told you early this year that you would see some incredible innovation from Apple across the year," said Cook, who replaced Jobs last year shortly before the death of the iconic co-founder of the California high-tech giant. "We think we kept our promise and we hope that you agree," Cook said, according to AFP. Also on Tuesday, Apple unveiled a fourth generation of the original iPad for the same starting price of $499 for a 16GB model with Wi-Fi connectivity. Cook said Apple has sold over 100 million iPads in two and a half years. He also said that more than 275,000 applications were now available for the iPad in Apple's App Store and that customers have downloaded a total of more than 35 billion apps. Last week Nuance Communications, the company behind the Dragon applications for iPhone, announced that it is launching its Dragon Dictation and Dragon Search in the Hebrew language. Apple several months ago decided to expand its operations in Israel. In April, the company’s new development center in Haifa was recruiting hi-tech engineers.